Wendy Garrett garnered media attention for running the 2014 Boston Marathon after recovering from a spinal cord injury sustained in Bermuda. She submitted her story of overcoming obstacles in a contest for the November 2014 New York Marathon and many people became aware of her mantra “Life is tough, but I am tougher.” She is a member of The Church of Jesus Christ of Latter-day Saints. Garrett is from Turner, Oregon, where she grew up participating in gymnastics. She switched to running when she was 23 and ran marathons in Los Angeles and Austin, Texas. She moved to Bermuda to coach gymnastics for three years. One day while driving a scooter to work, she hit a car and her bike landed on her. The accident rendered her left leg useless and left her with several neck and back injuries that sent her back to her parents’ home in Oregon to recover. After over two years of doctors and therapy, she found a doctor in Provo, Utah, who fitted her with an orthotic so she could wear shoes and be active again. She paid for her orthotic by selling rubber bracelets emblazoned with her mantra. In March 2013 she ran her first steps in more than three years. By June she was able to run the Utah Valley half marathon and placed first in the mobility-impaired category. She moved back to Oregon to help care for her sister who was fighting colon cancer, and Garrett continued to train to run a marathon. She ran in the Portland Marathon in October 2013. The day she received word she had qualified to run in the Boston Marathon, her sister had to be hospitalized and died one month later. Garrett then overcame a knee injury that happened three weeks before she was set to run. 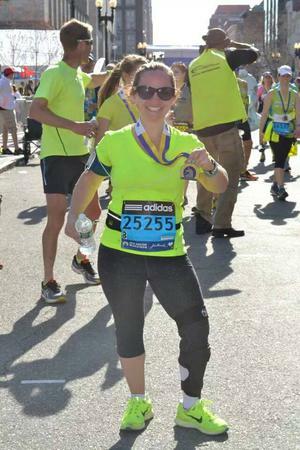 After the Boston Marathon, she started to decline, and realized she hadn’t dealt properly with her injury, the death of her sister, and was suffering from depression. Although she didn’t win, the Runners’ World contest helped her heal and she finished the 2014 New York Marathon seventh in the mobility-impaired category. She ran in the 2015 Boston Marathon and placed fourth in the Women's Mobility Impaired category. This page was last edited on 7 August 2015, at 16:13.